Editor's Note: Opening this Friday, July 10, is Jeffrey Levy-Hinte's Soul Power. Here's a Doc Shot that Tamara Krinsky conducted with the filmmaker during the film's screening at the 2008 Toronto International Film Festival. The DOC SHOT Q&A is an exclusive online feature by Documentary magazine associate editor Tamara Krinsky. Through this mix of questions (some serious, some sassy) each DOC SHOT provides a glimpse into the work and lives of those creating and supporting nonfiction film. 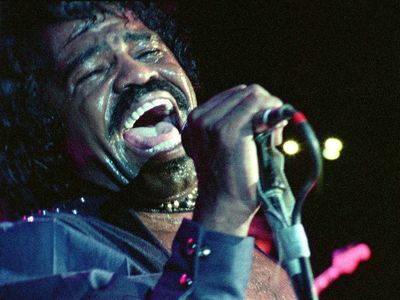 Soul Power is a vérité documentary about a legendary music festival (dubbed "Zaire '74"), and it depicts the experiences and performances of such musical luminaries as James Brown, BB King, Bill Withers, Celia Cruz, among a host of others. The concert has achieved mythological significance as the definitive Africa(n)-American musical event of the 20th Century, and Soul Power portrays the event in all of its cinematic glory. Your role/credit on the film. How did you find your subject or become involved in the film? Thirteen years ago I was an editor on When We Were Kings, and since that time I have been fixated on the notion of making a film of Zaire '74, which was left on the cutting-room floor when we made Kings. Two and half years ago, I took the leap of faith to make this film, and Soul Power is the result of my efforts. Was there a moment in this film that went a different way than you expected? I didn't foresee the diversity of opinions that greeted my initial cut of the film-from bewilderment and harsh criticism to high praise and encouragement. Ultimately I learned a great deal from those who took exception to aspects of the film, and I am confident that I was able to make a better film for it. If you had had an extra $10,000 to spend on your film, what would you have used it for? The film is finished and I am not left wanting. Ultimately I would put the money toward a 35mm output of the film, for though it looks great on HD, it was shot on 16mm film and we did a 2K intermediate, so I feel that presenting Soul Power on film would give it a slightly more authentic and organic feeling that I would personally like to see. What excites you about playing your film at the Toronto International Film Festival? I love the idea of premiering the film before a real audience of moviegoers. Many of our top festivals are so industry-saturated that the whole nature of the audience is distorted. If you've had time to check out the TIFF catalogue, is there a particular film (aside from yours) or event at the Festival that you're looking forward to attending? The TIFF curators rarely disappoint, so in truth I would like to see most all the films. If I was to choose a single film it would be Richard Parry's Blood Trail, as I find the topic fascinating, and knowing the vagaries of distribution I might not otherwise have the opportunity to see it. What's the first film you remember seeing as a child? I recall seeing Cabaret broadcast on network television when I was quite young. Of course, I could be remembering a TV commercial or otherwise imagining the whole thing, but whatever happened it left a powerful impression on me, and Cabaret is still a film that I greatly admire. Tell us about a film that affected you profoundly or changed/inspired the way you do your own work. It is impossible for me to answer this question as posed. I can say that Stanley Kubrick, Akira Kurosawa and Frederick Wiseman are my cinematic heroes, but even this list feels grossly restricted. What would surprise people the most about your job or the way you execute it? How tedious, boring and frustrating filmmaking can be. Of course there are wonderful high points, but they are still small islands in a sea of adversity and disappointment. But alas, filmmaking is a habit that is hard to kick! When you are feeling creatively stumped or burnt out, what do you do to get the creativity flowing again? Photography is my savior, and I am fortunate to live in New York City, where there is no end to the picturesque people, places and things. Daily essential read (online or off)? New York Times, offline version. What's on your TIVO (digital video recorder) or iPod right now? TIVO: portions of the Olympics and the DNC. I recorded them so that I could fly through the commercials, but I don't plan on watching them again. But I would like to say: OBAMA 2008! iPOD: Mahler symphonies, and an odd assortment of music that I don't listen to. Peace, love and understanding (for me and everybody else). Violence, intolerance, suffering (for me and everybody else). If you could add an extra hour to every day, how would you spend it?